Not that he really had to, but Fabinho has denied the false speculation about him wanting to leave and join PSG in January. Just before our Champions League tie with PSG last week, French outlets linked the player who cost us £43.7m [Sky Sports] in the summer to our victories opponents. They suggested that he was unhappy in England and wanted more game time, but the 25-year-old has dismissed the claims as nonsense. “I was told there was something in the press, but I never said that I would like to leave Liverpool,” Fabinho told UOL. 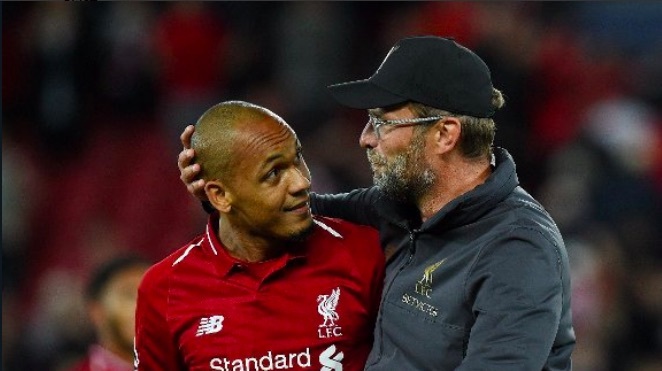 “[Klopp] did not give me a lot of explanations but I concentrated on my work in training and stayed focused on my work, without letting my head drop,” Fabinho said. “I tried to work because I knew opportunities would come. Now I just want to increase my number of games. Fabinho has had one or two poor games, but has honestly mostly impressed us when he’s been on the field. He offers a huge physical presence which shouldn’t be underestimated; and his ability to tackle and intercept with his long legs and set us on a counter-attack is fantastic. One weakness he has is selling himself to an onrushing attacker by diving in, which often sees us the victim of an opposition counter if he misses the tackle – but this will improve when he gets more accustomed to the speed of English football. For us, he should be a starter in Liverpool’s strongest XI now – hopefully alongside Naby Keita who like his fellow summer signing – has still to show us his highest level.